Made probably just before Henry IV issued the first orders for burnings to punish heretics in 1401, this manuscript escaped a similar fate. It contains copies of commentaries on the gospels in English, mostly translations of Church fathers such as Thomas Aquinas. Its author was a Lollard or a follower of John Wycliffe (c. 1330-1384). Wycliffe was an Oxford professor who held the Bible as the supreme authority over the clergy or even the pope. He inspired the first complete English translation of the Bible, and the Lollards, who took his views in extreme forms, added to the Wycliffite Bible commentaries such as this one in Middle English. Wycliffe was too well connected and lucky to have been executed for heresy, although the archbishop of Canterbury condemned him. The support of his Oxford colleagues and influential layman, as well as the anti-clerical leanings of King Richard II, who resisted ordering the burning of heretics, saved his life. Forty years after his death, the climate had changed, and his books and exhumed body were burned and scattered. Nonetheless the English translations had a lasting influence on the language. The translation of Matthew's gospel begins, 'The book of generacioun of Ihesu Crist: the sone of David. the sone of Abraham.' Following contemporary conventions, the first letter is historiated (bears a picture) with a portrait of Matthew, who holds a scroll. 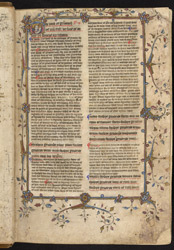 The gospel text, in short sections, is underscored in red, with the commentary following.